RJ12 on Kc question and resistors. as I see on pdf scheme of Kc and technical documentation, RJ12 IN and OUT pins are "mirrored" (J1 and J2), is it ok? 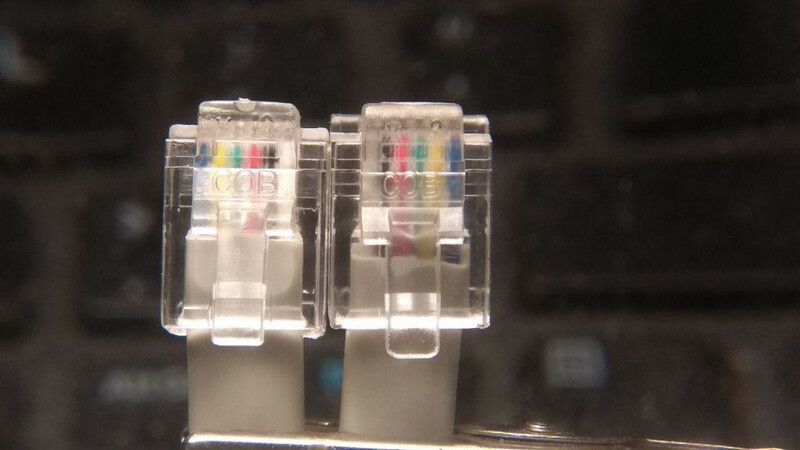 that would make the oposite desirable connetions? another doubt is the array of R (5 to 16) in pdf of HUB between VCC and SDA/SCL, but as I see on Kc scheme, this is also done with R1, R2 and R3, isn't it? The reason the pins are mirrored is that it makes every line flow in parallel. And if you use a flat cable to crimp the RJ12 headers you wont get a twist between KCeptors. The only precaution you have to follow is to also mirror the wires when crimping. The RJ-11 connector was really useful while prototyping the system, and we are still using it. But the idea is to look for an alternative to be used on future releases. Take a look at this thread. The resistors you mentioned are pull-ups for the i2c buses. Devices working with that bus are open drain: they can drive the line low, but cannot pull it high. The Chordata Hub is basically a multiplexer outputting 6 i2c pairs, and each of those needs its own pull-up. Same thing happens with R1 and R2 on the KC, they are pulling up the bus after the address translator. R3 is just to drive high some pins on the IMU. We are all still using RJ11, the another thread is just about brainstorming ideas for the future. The USB-C is just one possible solution, but it has some drawbacks.